The U.S. Army Corps of Engineers is gearing up for its biggest-ever planned spill of water over dams on the Columbia and Snake rivers. It's a controversial move that was ordered by a federal court to help endangered fish avoid extinction. To make sure it's done right, dam managers tested their options first, using miniature models of Northwest dams way down in Vicksburg, Mississippi. What are the miniature versions of Northwest dams doing in Mississippi? Turns out, Vicksburg is home to a whole lot of miniature models. It all started back in 1927 with a massive flood on the Mississippi River. Congress created a lab to help manage future floods, and engineers dug a mini Mississippi River right into the dirt in Vicksburg. "The mission is solving the most challenging problems," said Jackie Pettway, chief of the Corps' Coastal Hydraulics Lab in Vicksburg. "You know, the problems that are too big for engineering firms to tackle." One of those problems is figuring out how to spill more water through dams without disturbing the delicate balance of hydroelectric power generation, water storage and fish survival. 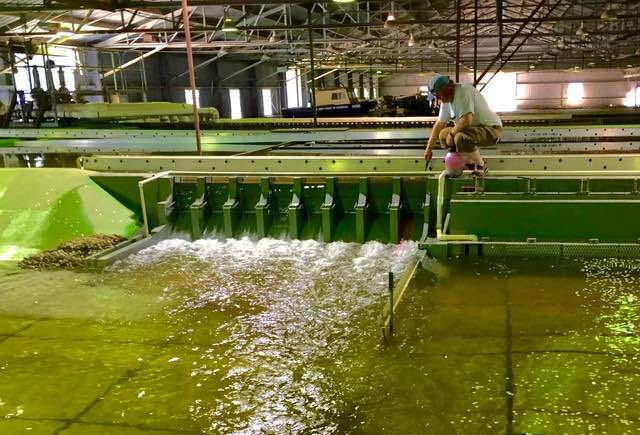 The Vicksburg lab has more than a million square feet of hangar space filled with miniature models based on dams across the country -- including all eight major dams on the Columbia and Snake rivers. In the Northwest, dams are scattered along hundreds of miles of the Columbia and Snake rivers. But down in Vicksburg, you can see several under one roof. Inside a massive hangar at the lab last fall, Rock Peters with the Northwest Division of the Corps of Engineers in Portland was surrounded by mini dams. "Right now we're standing between two models," he said. "We have The Dalles general model on our right and on our left we have Lower Monumental." In the real world, it would have taken a three-hour drive through southeastern Washington to travel from one dam to the other. The laboratory versions look like very long kiddie pools, with just a couple feet of water flowing through a mini dam. About a dozen people from Northwest agencies and tribes were gathered around The Dalles Dam model. Some were standing on top of the dam itself, which is roughly the size of a small footbridge. "We're looking at new spill patterns and new spill levels as part of the court injunction," Peters said. Meeting the legal limit at some dams will mean increasing the amount of planned spill by 50 to 100 percent. Tucker Jones, Columbia River manager for the Oregon Department of Fish and Wildlife, is on the winning side of the judge's order to spill more water through dams -- instead of sending it through turbines to generate electricity. "We know that more spill is better," Jones said. "The turbines, that is the worst route. Blades that are spinning are not typically good for living things." Sending fish through spill bays instead can move them quickly on a straight path downriver -- a much better route for juvenile fish headed to the ocean, he said. While fish might survive a trip through the turbines, they could suffer or even die from it later. To save endangered fish, Jones says, we need to help more of them survive to adulthood. Right now, for many runs of threatened and endangered salmon and steelhead, less than two percent of the juveniles that leave the Columbia River Basin return as adults. In 2016, a federal judge rejected the latest plan for helping salmon survive dams in the Columbia River Basin. As a result, federal agencies are revamping their long-term dam management plans. "While those things are playing out, we felt we needed to do something now," Jones said. "We're looking for short-term: do something now for fish that are in real trouble." But dam managers say spilling more water is complicated. It can send fish in the wrong direction. It can create eddies and make baby salmon more vulnerable to predators like birds, sea lions or other fish. It can also cause erosion and damage the dams themselves. Brad Bird, a senior hydraulic engineer with the Corps, said the miniature dam models are crucial to designing a spill plan that will help fish without creating problems to the rest of the hydro system. "They're invaluable," he said. "I don't know how you'd do what we do without them. Nobody wants us experimenting with endangered species." The models don't generate electricity, and there aren't any fish in the kiddie pools. But otherwise they're just like the real thing -- only 50 to 80 times smaller. The bottom of the pools surrounding the models are shaped exactly like the bottom of the river, so they offer an accurate picture of how water will move when it's spilled through the full-size dams. Managers study where the water will go as it moves downstream by injecting hot pink dye into the mini dam and sprinkling confetti in the surrounding pool. The water flows through the part of the dam that looks like a row of garages. Each section is called a spill bay. The direction the water flows can be adjusted by changing the amount of water flowing through each individual spill bay. The trick is to make sure the spill sends water in the right direction for both baby salmon swimming downstream and adult salmon swimming upstream. Mike Langeslay, a fish biologist with the Corps, is standing on the full-size version of The Dalles Dam, east of the Cascades. "If you look downstream, see that little peninsula down there with rocks and land and little islands?" he said, pointing. "That's pretty well-known predator habitat -- for birds, gulls, small mouth bass, northern pike minnow." Out here, it's half a mile across the river from Oregon to Washington. And you drive -- rather than walk -- across the top of the dam. The dam has 23 spill bays, each with its own massive gate that opens to release water. Langeslay said they used to open all the spill bays in the spring, sending fish right into predator habitat. They've used the mini dam to solve that problem. They now open fewer spill bays and they built a wall in the river to steer the water in the right direction. "We wouldn't have been able to do it without the model," Langeslay said. "I mean, can you imagine trial and error sticking a wall in there?" Standing on top of an open spill bay is like standing on top of a waterfall. It's a huge drop down to the river. "If you look at it, it doesn't look like it's very friendly to fish," Langeslay said. "It's surprising that it actually is. The visual is, you know, certainly a person falling through this wouldn't survive." Managers track fish survival through dam spillways, and the numbers are good. On average, Langeslay said, about 98 percent of the fish survive. The question is: for how long? As the Corps starts spilling more water this spring, advocates are convinced it will help more fish survive to adulthood. Critics like Terry Flores, director of the industry and commerce-backed group Northwest River Partners, say the science isn't clear on whether more spill will mean more fish will survive longer. "There is no proof that more spill will be better for fish," Flores said. "That's why we're so skeptical. We want things done based on good science." Meanwhile, spilling water to meet the judge's orders could cost up to $40 million, according to an estimate from the Bonneville Power Administration. The agency has plans to add any extra costs to the region's electric bills in the form of a spill surcharge. Dam managers could be wasting water on spill, Flores says, and sacrificing hydropower without getting any more fish. This Theme Park's Replica Mini-Dams are Attracting Northwest Scientists to Mississippi <-- Listen at original site.